While serious Pete fans almost always have a working knowledge of the Classic Range shapes from first-hand experience and a few more-or-less available catalogs, the B shapes are something else, even for the knowledgeable. 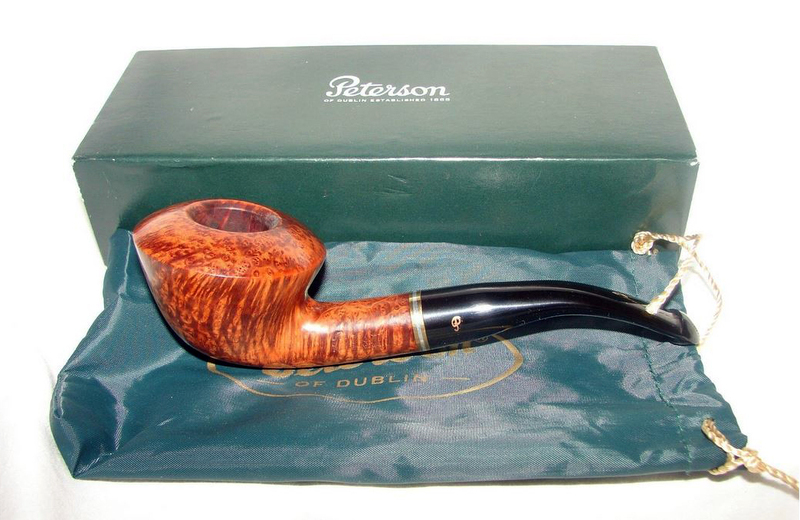 These began appearing not long into what we call “the Dublin Era” in The Peterson Pipe, which began in the early 1990s after Tom Palmer assumed direction of the company. Many of the Bs have never been documented in the Peterson ephemera, silently surfacing in the market for a while, then submerging. The series seems to have began around 1998—the first year of the Limited Edition—with seven shapes: B1, B2, B5, B7, B8, B10 and B11. It would be convenient if all new shapes after 1998 had been given the B designation, but that is not actually the case. Some of the Bs were launched as original shapes, but many began as Limited Edition or special collection named issues, then trickled down into less expensive lines after the high-grade had run its course. The Derry Rustic line is the company’s most recent and complete realization of this idea, being specifically created to utilize the Bs even as they disappear from production. While we’ll say more in the book about this shape group, I thought now might be a good time to create an on-line reference guide, as this lies outside the scope of the book. In what follows I’ve given the original release (if known) of every B shape from 1 to 65, a few illustrations of the shape in various production lines, and average measurements (if known). This is, however, a work-in-progress, so if you have additional information on shapes and lines or helpful photographs, don’t hesitate to contact me and I’ll incorporate these in a revision. This chunky brandy shape (which may be a “setter”) is a mystery to me. The two photographs I’ve been able to source show it as a higher-grade Kildare (pictured above) with sterling band and a mid-grade Killarney (seen below) with nickel and acrylic sandwich band. To add insult to injury, I don’t have any documentation of the Kildare with a sterling band, but here it is! It seems reasonable to date it to 1998 by the photograph of the 1998 B7 Kildare pictured later in this blog. 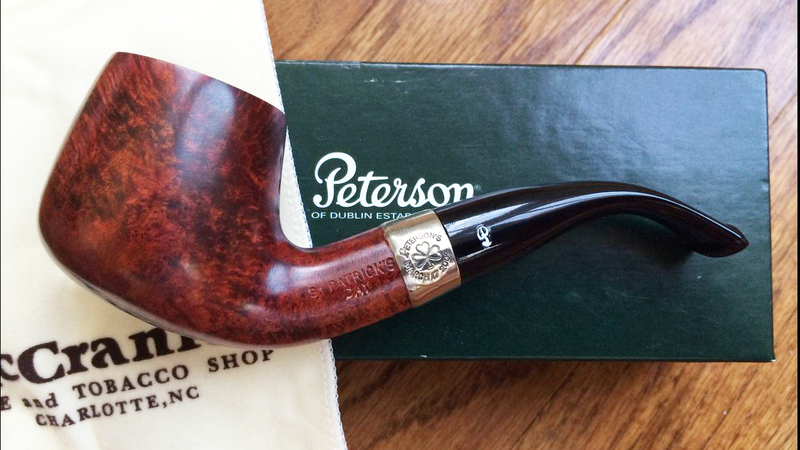 The Kildare’s box is a bit of a problem, as the “Younger Thinking Man” was used by Peterson from c. 1989 to 1992, and why would a 1998 pipe be in a 1992 box? 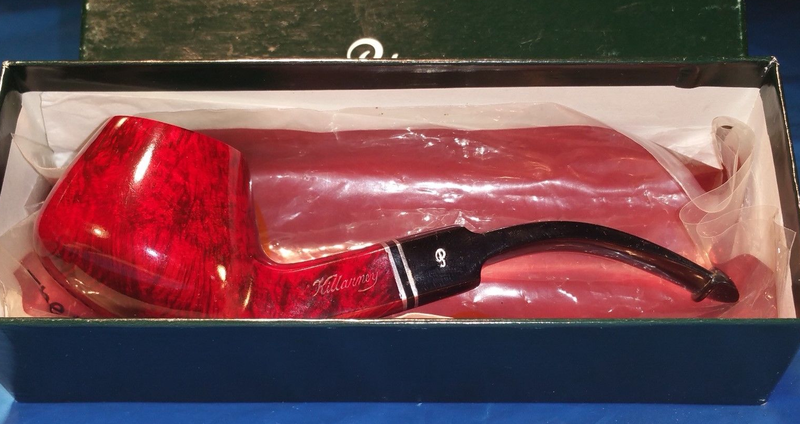 Mismatched boxes are probably the rule rather than the exception in the world of brick & mortar-era pipe-collecting. It makes me wonder if the B1 might be dated earlier than ’98. Oh well, at some point in the future, it would be fun to see if it is possible to put together some dates for Peterson pipe boxes. 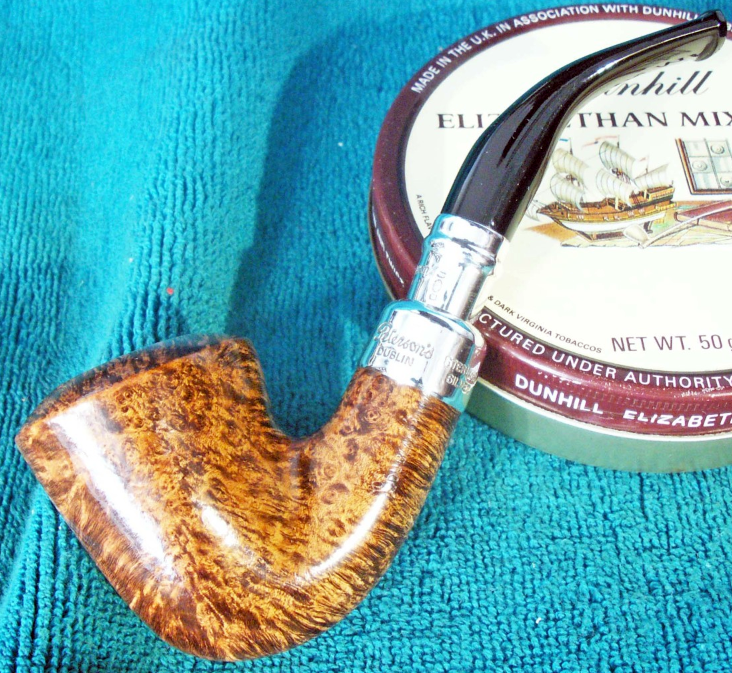 A straight Rhodesian “setter,” the B2 seems to have its origin in the 2002 Limited Edition bowl, albeit without the fancy double-beading. It is, however, slightly smaller than the original, although that may just be the two pipes I’ve examined first-hand. In any event, it was discontinued in 2013. 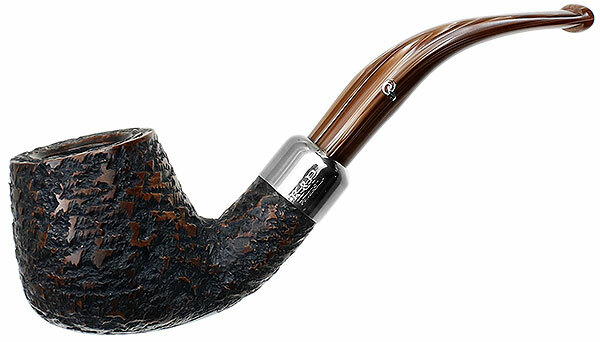 It has a strong Peterson design flavor in its B presentations, the massive bowl out of proportion to the stem, which may be one reason it remained in the catalog for so long. Pictured above: B2 Aran; below, Donegal Rocky and Natural Linseed Army from Lubinski. There is no stock number for a B3, according to Tony Whelan, factory manager, so if there was a prototype, it never went into production. Like the B3, no stock number exists for this number. 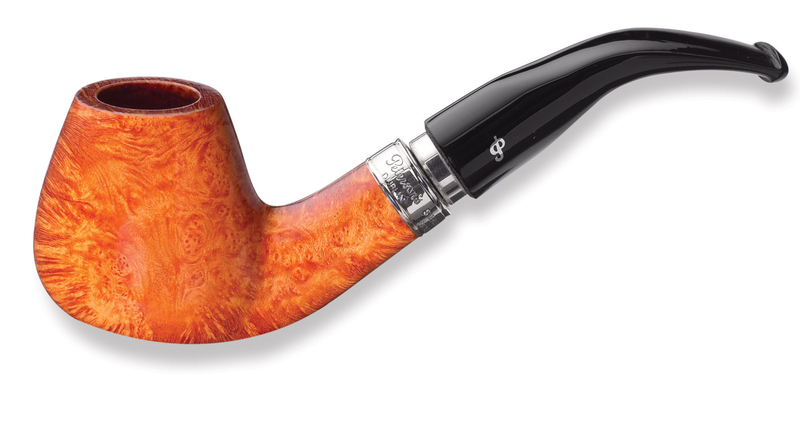 The B5 is a quarter-bent bulldog-Dublin hybrid, and fully embraces the Peterson design aesthetic: you can see how it adapts the current 150 bulldog’s massive shank. It proved so successful that it is the only one of the original seven B shapes to find a home in the Classic Range pipes. Pictured above: the B5 Flame Grain. 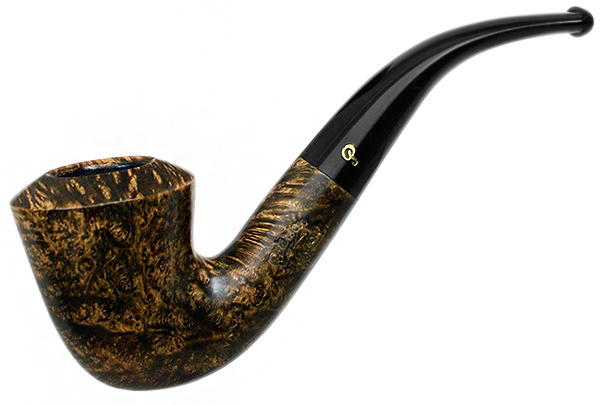 Below: Royal Irish Black Sandblast and Rosslare Classic. No stock number exists for this bowl. 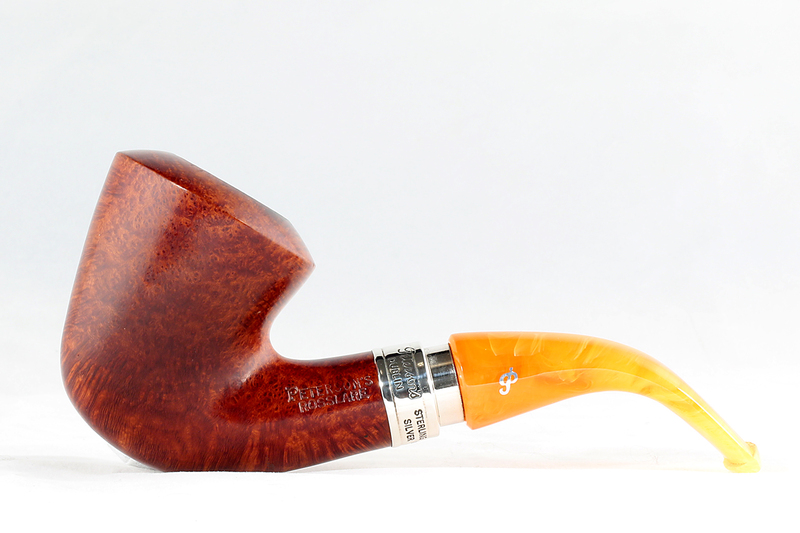 The B7 is a wide-brimmed variation on the quarter bent Rhodesian and always elicits favorable comments. 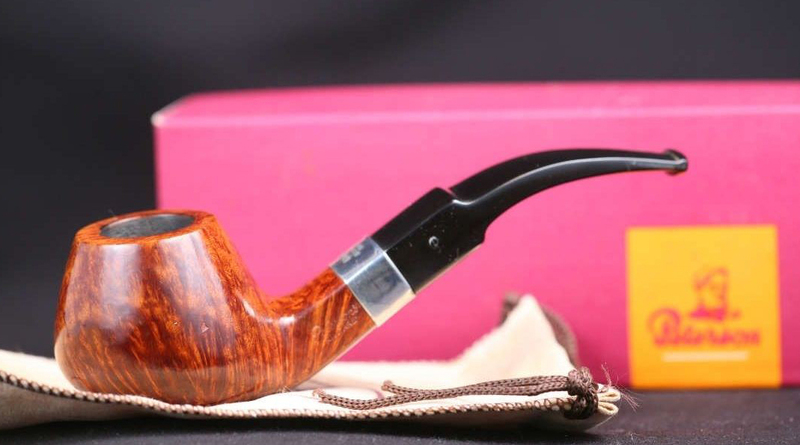 It seems likely it was first issued in 1998 in the Kildare line, as documented by the Smokingpipes.com photograph seen below. Like the B1, it was also issued in the lower-grade Killarney line just a little later. It then disappeared for several years, re-surfacing in the Donegal line in the past year or so, and now in the Derry Rustic as an army mount. 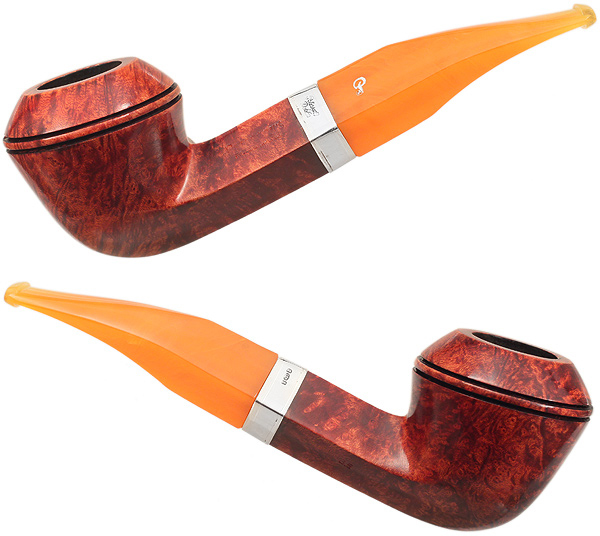 Pictured above, the 2002 St. Patrick’s Day issue; below, a B7 Flame Grain followed by the 1998 Kildare. Bowl Height: 1.60 in./40.64 mm. My hunch is that is that this bent-brandy / pot hybrid is another original-issue B shape. It had already made its way to the St. Patrick’s Day line by 2002, having appeared in the Limerick line. It has resurfaced recently in the Donegal Rocky, and now as an army mount in the Derry Rustic line. Pictured above: 2002 St. Patrick’s Day; pictured below, the recent Donegal followed by the Derry Rustic army mount. .
Chamber Depth: 1.58 in./40.12 mm. Chamber Diameter: 0.82 in./20.89 mm. Outside Diameter: 1.63 in./41.30 mm. 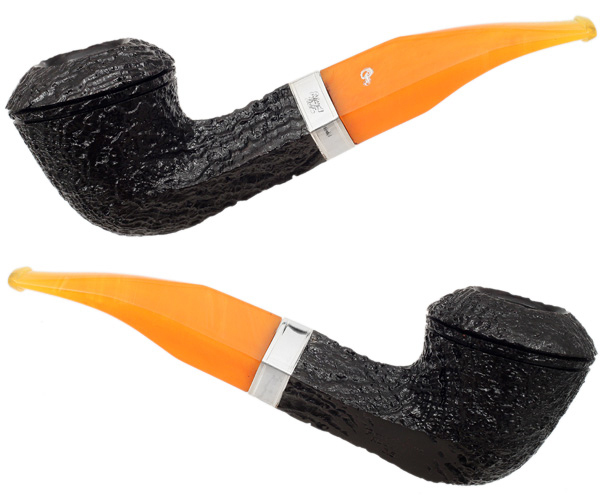 The B10 and B11 seem to have been released at the same time, and both have found a home in the Classic Range in almost every line Peterson issues. 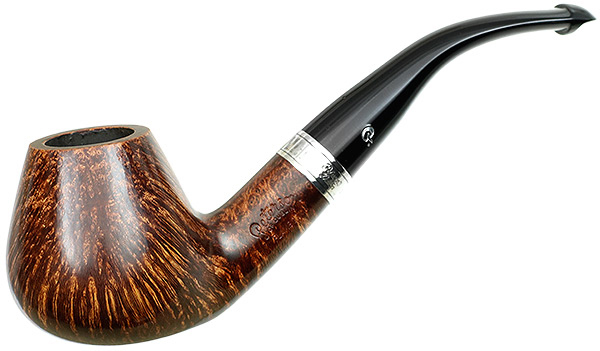 Sykes Wilford describes the B10 as a “Calabash variation,” featuring “the softly convex rim, blending elements of the bent Dublin, bent Bulldog along with the Calabash shape.” I have both pipes in the Rosslare Royal Irish line (with the faux spigot), hallmarked “S” for 2003, although it may have been issued before that date. I like its conical or V-shaped bowl, because it seems to require so few relights with Virginia flakes. Pictured above: a B10 Shannon; below, the B10 Summertime 2016, followed by a B10 Spigot. A bent brandy “setter,” like its sibling the B10 it seems to have originally appeared in the high-grade Rosslare Royal Irish line in 2003 and from there appeared in most every Peterson line. There is a bit of confusion about the Rosslare line, as the Royal Irish was not, in the beginning, stamped as such even though it was being advertised that way, and subsequently the line was divided into Rosslare (without the faux spigot, but retaining the sterling band and marmalade acrylic stem) and the Royal Irish (with the faux spigot, a lighter blonde finish and usually with a vulcanite stem instead of the original acrylic). Pictured above: B11 Flame Grain; below, a Royal Irish followed by a Rock of Cashel (Lubinski). and to Smokingpipes.com and AlPascia.com. 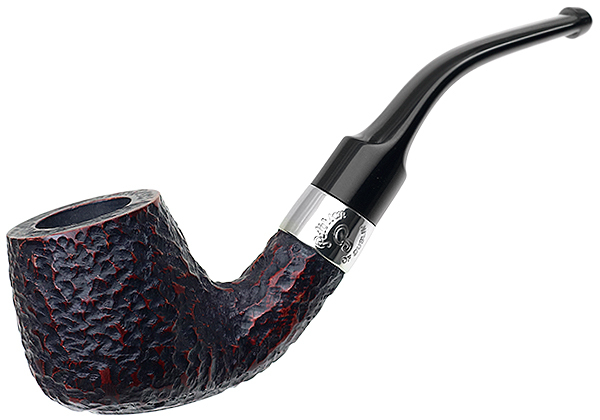 I had my local B&M order a Derry Rustic B37. Everything on back order and the way these B stummels are being done…guess we’ll see when she arrives. Hope it makes it for you, Chris. 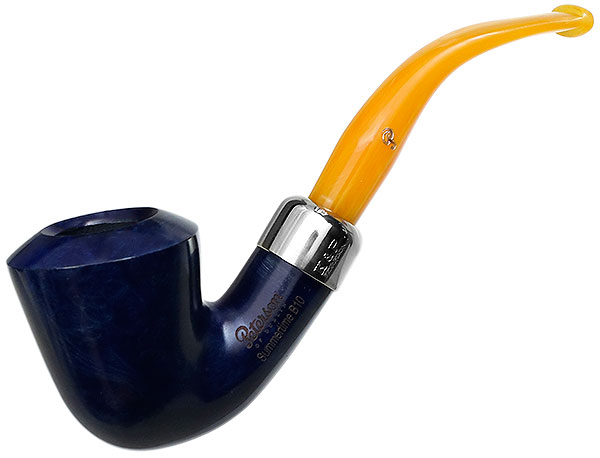 That’s a terrific-looking pipe. Hey I have a Pete Hunter series by James Fox shape B41. It’s great for smoking flakes and just looks like the 2009 POY. It IS the B41! Congrats! 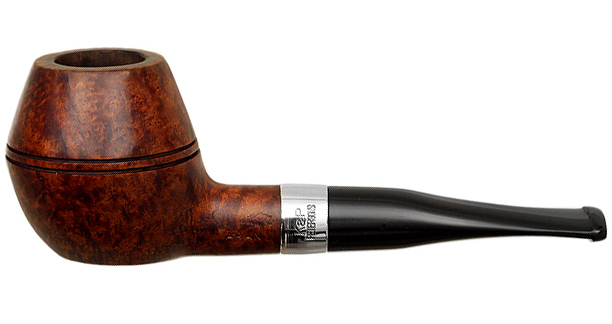 This is such a cool shape–I love the pinched stummel. Mark, thanks for putting this together it is a handy guide for the B series pipes from Peterson. I am reblogging it to share with the readers of rebornpipes.